Senior guard Elizabeth Horan scored eight points in the Lions' win. 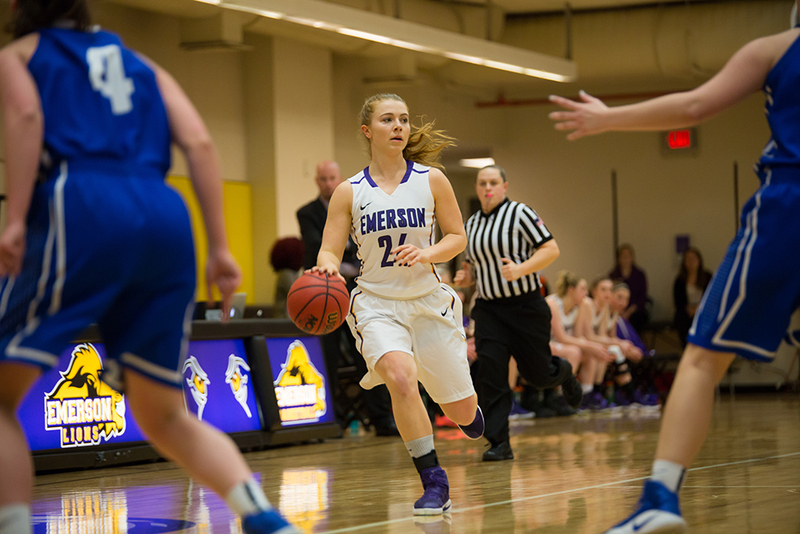 Charlie Boyle turned on the accelerators in the fourth quarter as Emerson’s women’s basketball team nearly squandered a 19-point lead on its way to the season sweep over Wheaton on Wednesday, winning 65-59. After a dominating 25-10 performance in the first quarter, the Lions struggled to keep possession in the second, picking up six of their nine first-half turnovers. The Lyons of Wheaton came roaring back with a 14-2 run in the last three and a half minutes of the second, then cut their deficit to one by the end of the third, 46-45. But Emerson never lost its lead, as Boyle broke free. Fighting through double teams and hard contact in the paint, the six-foot center made her first bucket in over 19 minutes and earned eight of her 12 points in the final period via layups, jump shots, and free throws. A block and a steal on defense helped her teammates contribute the other 11 points in the quarter and survive a late surge from the Lyons in the closing minutes. The final score is nearly identical to the result of the squad’s first bout on Jan. 4, when visiting Emerson won 64-59. It is the first time Emerson has won both its regular season matchups against Wheaton since joining the NEWMAC, moving ahead of Wheaton in the conference standings to ninth, with five games remaining. The Lions came out of the gate firing at the Bobbi Brown and Steve Plofker Gym. Boyle got the action started with a jumper, then Sierra Ducey kissed one off the glass, followed by a deep two from Natalie Busch, who is also the Beacon’s deputy arts editor. Then Maya Savino put up back-to-back layups and they led 10-0, while Eastin Ashby’s four steals aided in holding the Lyons scoreless for the first five minutes of the contest. Ashby responded to Wheaton’s first points, scored by Sophia Black, by nailing the first three-pointer of the game. Gould made his first substitutions at 3:52, checking in Elizabeth Horan who scored the team’s next eight points, and all of her points of the evening, with a layup and back-to-back threes. At the first break, eight different Lions had tallied a bucket, and Emerson earned its second highest first quarter point total of the season, behind its Nov. 19 victory over Simmons when the team scored 26. It was more of the same early in the second frame. With a 15-point lead, Gould went with three of his original starters in Savino, Ducey, and Boyle, but called up freshmen Leena Kardacz and Kate Foultz as well. The defense forced two shot clock violations within 90 seconds of each other, and with their offense jumped out their largest lead of the contest at 29-10 with 5:42 left in the half. Wheaton scored its first points of the quarter at 5:08 with a shot from Natalie Wind; then a three-pointer from Jill Bodreau, an eight-point run from Black, and Bodreau again from the stripe cut Emerson’s lead to single digits, 33-24. Busch ended a 6-0 run from the Lyons and the score held 36-25 at halftime. Wheaton edged closer in the third, outscoring Emerson 19-11. Black converted on both of her free throws and trailed by two with 59.7 seconds left. After a single Quinn Madden free throw, Abby Hamilton received a backdoor pass from Black with 19 seconds lefts and made the easy bucket to pull within one for the start of the final quarter. Over a minute into the fourth, Boyle reemerged after rejecting a Wheaton shot attempt and found the hoop twice in as many attempts to stretch the lead to five. Busch nailed one from the perimeter and repeated it after two Boyle free throws. It was 58-47 with 3:32 remaining before the Lyons scored. In a late comeback, Black earned her last field goal and game-high 17 points, Bodreau made her third from beyond the arc, and Hamilton brought the margin to four with another backdoor from Black with 2:26 to go. But five free throws from Savino in the last 20 seconds were enough to get past one last three from Bodreau and hold off the Lyons for the victory. Busch earned team-high honors with 15 points on 6-of-8 shooting and 3-of-4 from downtown. Savino followed with 14 in a game-high 34 minutes on 4-of-6 shooting and 6-of-7 from the charity stripe. Ducey was held to just two points but contributed nine rebounds, four assists, and two blocks. Boyle also hauled down nine boards, and her 12 points came on 5-of-8 from the floor. Emerson (10-10, 3-8) travels to Mount Holyoke College (2-17, 0-12) Saturday for a 1 p.m. game. Deputy arts editor Natalie Busch, who plays on Emerson’s women’s basketball team, did not edit this story.